Positioning a microfiche on a viewer can be difficult because the pressure of the lens holder can cause the microfiche to buckle and rotate on the screen. The sliding motion of the fiche through a pressure gate exhibits "stiction", at first sticking and then overshooting. Fine tuning the position to bring it back involves the same stiction and overshooting and adds to the user's frustration. 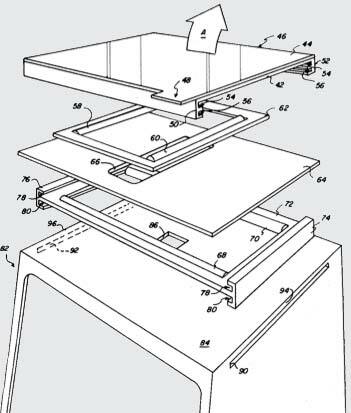 This is a positioning mechanism developed by Steve Hines in 1979 that allows a microfiche to be easily positioned while preventing rotation. The entire mechanism is very compact and self contained because the rollers move only half as far as the microfiche, always staying within the dimensions of the microfiche. The grooved guides keep the assembly together in a general sense, however the frame hovers around the rollers which are providing the frictionless movement. The microfiche is held under a hinged clear cover on a frame that hovers loosely around the rollers. 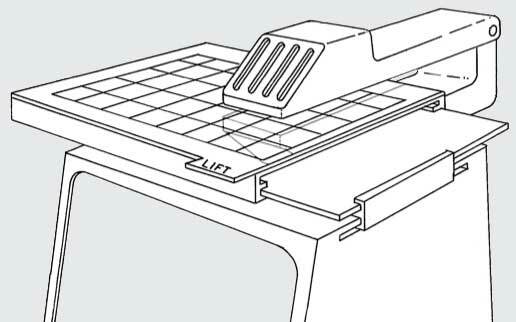 A pair of lateral rubber rollers (for front-back motion) rests on the top of the viewer. Another pair of longitudinal rollers (for left-right motion) rests on the first pair of rollers. 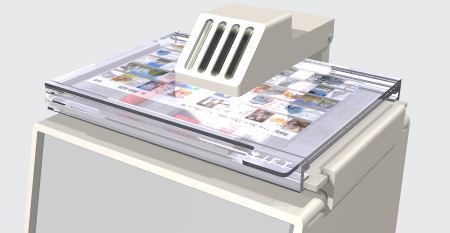 The hinged microfiche holder rests on the top rollers. Due to the almost zero rolling friction, the fiche holder can be moved almost with the feeling of pushing a floating cork on water. However, due to the very high friction of the rubber rollers, especially in the four contact points between upper and lower rollers, non-rotation of the fiche is essentially guaranteed. This is not a product for sale, but is shown as an example of engineering by Steve Hines, which clients can expect on a consulting basis.